Look past the underwhelming lobby and you’ll find the rooms at solidly built Anh Dao are great, bright and modern. Average rating 7.3 from 90 reviews. The clean tiled wetroom-style bathroom is absolutely enormous, with a high window to let in extra light. The electric heated shower is so far away from the door that you wouldn’t need to step onto wet floors to use the sink or mirror. The new drapery and linens are a hodgepodge of colours and while certainly not the most stylish, the room is everything a flashpacker needs really: bedside table with plug, air-con, fan, WiFi, TV and minifridge. Everything looks neat, tidy and well-maintained. Rooms have windows and a few have a balcony. Breakfast is not included though the hotel has a small restaurant at the bottom should you want it. A little English spoken. 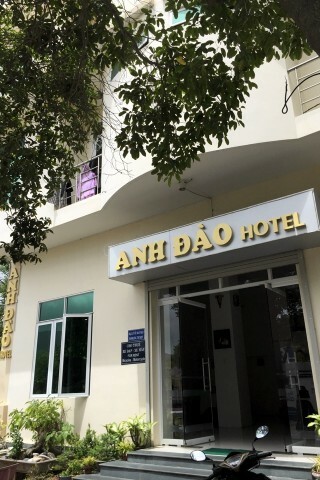 Check rates at Anh Dao Hotel on Booking.com.